One of the pine species in the NJ Pinelands is also down here: shortleaf pine, Pinus echinata. The New Jersey Pinelands Commission rejected the proposal by South Jersey Gas, which had partnered with the state Board of Public Utilities, to connect a pipeline to the BL England power plant in Cape May County. The plant is switching from coal to natural gas. Switching from coal to methane is also one of FPL’s excuses for piping methane, down here in the same coastal plain with the same kind of fragile limestone underground. But the commission deadlocked 7-7 on the proposal, meaning the measure didn’t pass. NJPC made the right decision. And that was for a 24-inch pipeline. 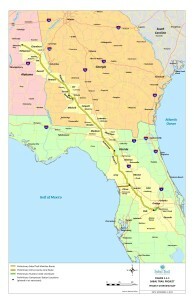 Sabal Trail proposes a 36-inch pipeline, for 2 1/4 more methane and more hazard. The AP story tries to spin it as about jobs, but we would get hardly any jobs from the Sabal Trail pipeline through Alabama, Georgia, and Florida, and we would get jobs from local distributed solar power. So the Sabal Trail pipeline is profit for executives in Houston, Texas and Juno Beach, Florida versus clean environment and jobs from solar power. No pipeline. Yes solar.